We are so excited to be starting our second year of Trail Guide To Learning from Geography Matters with our 4th grade son. I have said over and over that Trail Guide To Learning saved our homeschool. When my son started homeschooling, I tried the same curricula that my daughter used. Fail! After several curriculum changes, I was in a huge panic. Fortunately, I have good homeschooling friends who introduced me to Trail Guide To Learning and that changed everything. We no longer have tears over “boring” lessons and fights over getting the work done. Trail Guide To Learning saved our homeschool. See! I said it again! My list of things I like about Trail Guide is long. Here are my top five reasons I love Trail Guide To Learning. Trail Guide To Learning is a homeschool unit study curriculum that covers geography, history, reading, grammar, writing, science, and art. Just add math and you’ve got a full curriculum. This was a great thing for my son. Jumping from one subject to another was not working for him. He would want to take a break or quit after each subject. The Trail Guide lessons flow from one to the next. They all revolve around the main theme and keep the interest of restless students. I love curriculum that is rich with readers and supplementary books, maps, and resources. I really dislike having to hunt and gather all those books, maps, and resources. Trail Guide To Learning comes with everything in one box! Awesome! This is such a huge time and sanity saver. When it comes to education, we naturally look for resources that will teach the academic disciplines. What about character? Isn’t that just as important? Wouldn’t it be great to teach about good character qualities and give examples of those who had them? Trail Guide To Learning does that through out. Trail Guide To Learning units are all about great people who made a big impact on the world and how their outstanding character qualities helped them achieve their goals. Good character qualities are brought up in the books, in the discussions, and in the writing assignments. While there might be a little prep work from time to time, for the most part, we just open the Trail Guide To Learning book and start. The planning is already done for you. Each day’s activities and lessons are lined out. You just have to follow along. The first lesson of each week lists the supplies needed. Once those are gathered, you are done! Easy peasy. My daughter loves to read. She could read her way through her studies, be happy, and would learn a lot. My son is not that way. He tolerates reading, likes to be read to, and loves hands-on learning. He learns best when the material is presented in various ways so he doesn’t get bored. Trail Guide is perfect for him. Trail Guide has daily reading and writing assignments, read-alouds for the parents, hands-on science, map activities, art, and more. There are opportunities for notebooking and lapbooking. Each day brings something new. It’s never the same and never boring. There is so much thought put into the Trail Guide To Learning series. It teaches more than just facts and techniques. It cultivates a love for learning and develops parents as teachers. Find out more about this Cathy Duffy top 101 homeschool curriculum pick at the Trail Guide To Learning website. I am so glad to hear you say that Trail Guide saved your homeschool. People often look at me as if I’m being overly dramatic when I say that, but I am so completely serious. It’s nice to know I’m not alone. Same here too! We are only on week 2 of POE’s Pilgrims but it has been such a blessing in our homeschool life! I love this curriculum! Just wait! It gets even better! I’m copying part of my reply from another comment —>Last year, I did supplement grammar with some grammar games and mad libs. He isn’t strong in language, so he was getting parts of speech mixed up. This year, my 8th grade daughter is taking Essentials in Writing. It is strong in grammar, so I bought the 4th grade version for my son. So far, so good. It only takes 10 minutes a day and breaks lessons up into bite sized pieces. Essentials in Writing is a good fit with Trail Guide To Learning – at least for us anyway. However, I have talked to moms that have used no other grammar supplement and everything turned out just fine. As far as offering something more advanced for the 6th grader. You could throw in something that the 6th grader enjoys. If it’s writing, add a writing course. If it’s science, dive into science topics talked about in Trail Guide by doing some research or experiments. You could also do research papers or look up more books and videos about the people and places of Trail Guide. This looks very interesting. How long would you say you spend each day on this? I know you mentioned it’s an all in one unit study but do you ever have to supplement for any of the subjects, like grammar? Thanks!! We spend about 2-3 hours on Trail Guide depending on the projects and how motivated my son is 🙂 Last year, I did supplement grammar with some grammar games and mad libs. He isn’t strong in language, so he was getting parts of speech mixed up. This year, my 8th grade daughter is taking Essentials in Writing. It is strong in grammar, so I bought the 4th grade version for my son. So far, so good. It only takes 10 minutes a day and breaks lessons up into bite sized pieces. Essentials in Writing is a good fit with Trail Guide To Learning – at least for us anyway. 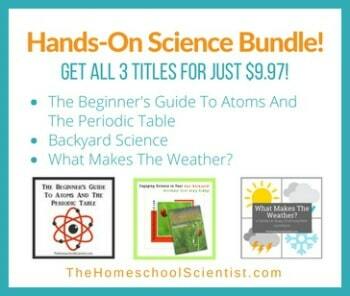 Being The Homeschool Scientist and all, I was concerned about the Trail Guide To Learning science being too light when we started it last year. My son really enjoyed Nancy Larson Science the year before we started using Trail Guide, so I stuck with it last year along side Trail Guide. It went fine. We love Nancy Larson. However, this year, I am just doing the science within the Trail Guide To Learning curriculum. The science isn’t light. It is just different. It is more of a CM approach than a traditional textbook curriculum. There is, also, plenty of room to expand your science study and go deeper if you want to. I did a little extra supplementing, but probably just because I’m a science geek! We purchased POS this year and I was really excited about trying it, but we have had to put it aside for now and just do something else for the time being. We found that it was a bit cumbersome to use, switching back and forth between the Middle School Supplement and the Brown Hardback Books. Sometimes we weren’t real clear on what we should be doing either. This was slowing us way down and we really didn’t need anything to make our homeschool day go any slower, as my son doesn’t work very fast. So I was disappointed but am not giving up on it totally. I really love the content of POS and think that it has a lot to offer, but we will have to add it back in gradually. My son did love the two books that he started reading (Abigail Adams and Calico Captive). That alone is wonderful for us because while he knows how to read very well, he isn’t an avid reader yet. But we didn’t get much farther. There were other parts that he liked somewhat, but it seemed that he could never just be done with a subject without having to go back and look at something that he thought he was already finished with. We both found that to be somewhat frustrating. I hope that once we get back into it gradually, we can find a way for it to work more smoothly and I can then post an update with a better report. Any thoughts on how to make it less cumbersome? One on one learning and customizing to fit for your child’s learning. I am one with you in promoting homeschooling. I’m curious if you continued using Trail Guide to Learning and what your opinion is after going through a few years of it. I’m considering switching to this curriculum but have had a hard time finding recent reviews. Would love any input you can share. Thanks! Is this a religious curriculum?